"UC Santa Cruz has a good core set of professors working in data science and machine learning. There’s a broad spread of research interests among professors within the department." Filtering, or dynamic state estimation, is a central problem in many areas of engineering including control, robotics, and signal processing. Historically, both the theory and algorithms for filtering have been developed from a transport or PDE viewpoint. While successful in many settings, computational challenges remain for filtering of general nonlinear systems. In this research talk, I will report an emerging geometric viewpoint that filtering equations can be seen as gradient flux or steepest descent of certain functionals in the manifold of probability density functions. This framework enables us to express filtering as proximal operator recursion in infinite dimensions. I will report theoretical results establishing the consistency of this new approach. In the linear Gaussian setting, I will explicitly carry out the proximal recursion to recover the Kalman-Bucy filter. For nonlinear systems, we are naturally led to apply proximal algorithms, thus opening up the possibility to solve nonlinear filtering via convex optimization. This is a topic of ongoing research. 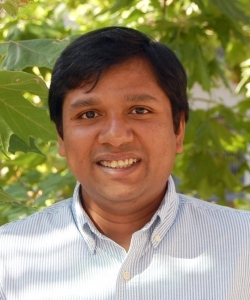 Abhishek Halder is an Assistant Professor in the Department of Applied Mathematics and Statistics at University of California, Santa Cruz. Before that, he held postdoctoral positions in the Department of Mechanical and Aerospace Engineering at the University of California, Irvine, and in the Department of Electrical and Computer Engineering at Texas A&M University. He received Bachelors and Masters in Aerospace Engineering from IIT Kharagpur in 2008, and PhD in Aerospace Engineering from Texas A&M in 2014. His research interests are in stochastic systems, control, and optimization with application focus on large-scale cyberphysical systems.